Sean Flaharty, historian and logistics director of the Eyes of Freedom and gallery director Marine veteran Mark Strahle, stand before a painting of solders from Lima Company 3/25. The reserve unit, mostly from Ohio, lost 23 members between May and August 2005 in Iraq. The Antelope Valley College hosted “The Eyes of Freedom” a traveling memorial gallery paying tribute to the service and sacrifice of 23 Marine reserve unit members killed between May and August 2005 in Iraq, and honoring all those who answer our nation’s call — past, present and future. Purple Heart recipient and Marine veteran Mark Strahle served with some of the 23 men depicted in the gallery. Strahle was badly injured and six of his team mates were killed in an explosion on May 11, 2005, by a roadside bomb. Lima Company 3/25 was one of the hardest hit units in Operation Iraqi Freedom. After seeing “The Eyes of Freedom” unveiled at the Ohio Statehouse Rotunda in 2008, Strahle knew he had witnessed something truly special. At first, the life-size portraits were difficult to view, yet a sense of honor and remembrance soon prevailed, explained Strahle. Three years later he contacted Anita Miller, the artist and creator of “The Eyes of Freedom” requesting to host the memorial at a veteran’s support fundraiser he was organizing. 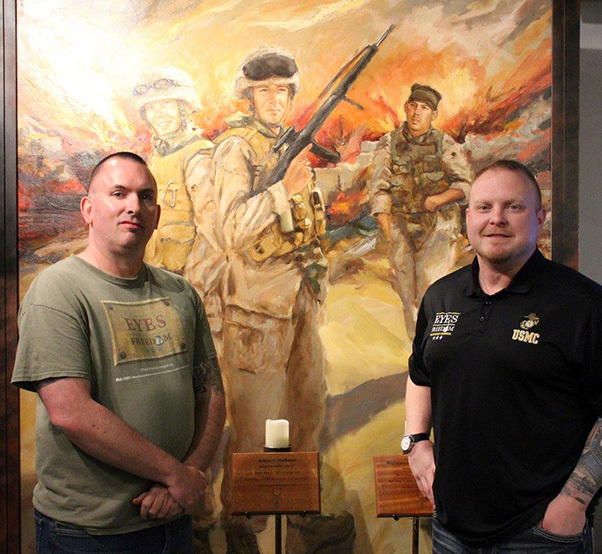 “Traveling with the memorial keeps these men alive in our hearts and it is a great tribute and reminder of the sacrifices made so we can enjoy our everyday freedoms,” said Strahle. Sean Flaharty, historian and logistics director of the gallery said that he worked at an insurance agency with Sgt. Justin F. Hoffman in Ohio. The passion and conviction of Flaharty is undeniable. “Anita had a vision and saw the gallery in the Rotunda. She woke up, saying she could smell smoke — the vision was so real, she had to paint these men.” Two years later Miller’s paintings were at the Capitol, just as she saw them in her dream. Both Strahle and Flaharty are continuously inspired by the communities they visit. Unable to recall her name at the moment, Strahle said that a wonderful lady from a trophy shop in Lancaster came by and gave them dog tags for all of the fallen soldiers. The beautiful tags include the soldier’s photos and will now be a permanent part of the memorial, displayed above their original combat boots. 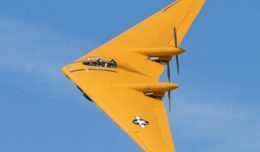 Strahle and Flaharty are hoping to display the gallery next year at the Los Angeles County Air Show. For more information, visit www.eyesoffreedom.org.